Amongst this year's amazing summer of sport there have been few failings - despite the fears beforehand. One though must go down as a terrible injustice to the efforts of those involved, especially being that it concerns a charitable organisation and the incredibly inspiring Paralympic Games. What should have been one of the World's biggest platforms for promoting a most worthy cause was ignored by Channel 4, who instead played their own countdown 'VT' rather than transmitting the Games' official opening sequence - one which was timed with military precision to the second! Phil Whalley describes the story behind this incredible spectacle, with background and technical details from Guy Westgate. All photography by the author. The 80,000 inside the Olympic Stadium were witness to the event as it was planned to be executed, with a combination of a big-screen video piece cueing in the arrival over the arena of a Tecnam P2006T twin aircraft trailing specially designed pyrotechnics. Lance Corporal Dave Rawlings appeared on the film telling the story of how he was seriously injured whilst serving the country in Afghanistan, leaving him permanently disabled. During his rehabilitation back in the UK Dave was given the chance of a trial flight by the charity Aerobility, going on to gain his PPL. It was Dave - cued in by his own instruction to the crowd within the stadium to 'look up' - flying the aircraft, thanks to the charity that does so much to bring aviation to those who would otherwise be unable to experience the pleasure of flight. That moment in time - which lasted for around 70 seconds - was the culmination of four years of planning, involving many people and organisations, sometimes coming up against seemingly insurmountable constraints and bureaucracy, and taking on the Paralympic axiom: 'To triumph over adversity and to excel in everything that is possible, to concentrate on what you can do and not what you can't'. The story of the Aerobility Paralympic flypast must start with the charity itself, and its inspirational Chief Executive Mike Miller-Smith who was diagnosed with muscular dystrophy in his twenties and now uses an electric wheelchair at all times, but still chases his passion for aviation and to share the freedom of flight. The organisation started in 1993 as a group of pilots and friends with disabilities that met to represent disabled flying in the UK, calling itself the Delta-Foxtrot Club, otherwise known as the Disabled Flying Club. It became a charity in 2000, and renamed as the British Disabled Flying Association in 2003. The charity was given some Bulldog aircraft from the Royal Jordanian Air Force the same year, and Mike Miller-Smith answered a call for help to get them flying. He joined the Charity's management team a year later, becoming Chairman in 2006 and Chief Executive in 2008 when the group was based at Lasham. 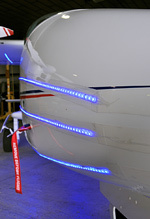 The name Aerobility was adopted in 2010 and the base moved to its new home at Blackbushe Airport in 2011. Aerobility is the only flying charity with its own aircraft, a Piper Cherokee-Six, and three Piper PA28 Warriors, all modified to help anybody to fly. Whatever their age, disability, illness or social background, Aerobility will aim to get people airborne and use the gift of flight as a tool for improving lives, and many continue to gain their PPLs. Mike first got an idea about doing a flypast for the Paralympics when it was announced that London had won the 2012 games, and a chance meeting in 2008 led to a trial flight with David Morris, a Senior Policy Adviser to the Mayor of London, who then went on to become the Olympic Diversity Coordinator. The options were limitless, but some early conversations with the Paralympic Opening Ceremony (POC) creative team and the Civil Aviation Authority (CAA) set some constraints that would prove to be some of the biggest hurdles: The Opening ceremony would be an evening event in the Olympic Stadium, so the flypast would probably need to be a night flight with a clearance to fly over London. This still did not deter Mike who had seen American night displays and a twilight glider display at Bournemouth with wingtip fireworks, so knew that something was going to be possible. Guy Westgate, the pilot of that twilight firework flight, is an air-display innovator and has pioneered flying with pyrotechnics with both aerobatic aircraft and gliders, so was an ideal addition to the team, taking on much of the flying side of the project. The next problem was to find a suitable aeroplane and the difficulties of this choice were immediately apparent. Experimental types can be modified easily with a 'permit', but are not permitted to fly at night. There are also very few twin-engined aircraft in this category. Fully certified aircraft have the advantage of being allowed to fly anywhere, but any alterations require a lengthy and expensive modification procedure, with the risk of being unsuccessful. Mike started asking some operators of certified aircraft for help and Tim Orchard of Tecnam UK soon offered his new P2006T Tecnam twin. The four-seat P2006T is a recent design from the Italian manufacturer, first flying in 2007 and gaining EASA certification in 2009. The creative brief was to fly the aircraft over the stadium with some light and pyrotechnic effects for between 2-3 minutes. The challenges were enormous as most fireworks last for only a few seconds, drop 'dross' and ash or are simply too dangerous to attach to an aircraft. The inspiration came from a pioneering parachute display in Bahrain that used a theatrical 'stage' firework, strapped to the parachutists' legs for a night-time descent. Local pyro manufacturer Wells Fireworks took on the task to develop the concept, and, with no aircraft test platform available in the Spring of 2012, worked with Michel Carnet, Paramotor World Champion to fly with some of the pyro prototypes and combinations until reaching the optimum effect of duration and spark intensity. 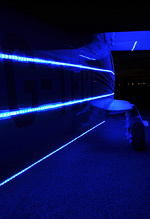 The effective illumination of the Tecnam could be boosted with lights and the idea to use High Intensity LEDs came from watching the latest night flying kites. 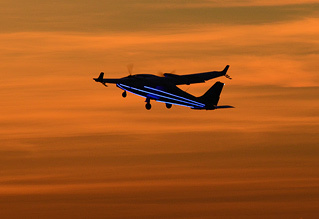 The final high-speed trials of the pyrotechnics and LED strips were made with GliderFX, Guy Westgate's new glider display team - so another piece of the puzzle was taking shape and fitting into place. Afandi Darlington is a world-renowned design engineer, and started the design for both the LED lighting scheme, the aircraft battery installation and the all important wingcuffs for the Tecnam. The individual pyrotechnics would be bundled into clusters and attached to prongs of a fork, trailing behind each wingtip. Tecnam's Managing Director, Paolo Pascale, generously sent a pair of winglets for Tim Dews, of Airborne Composites, to fabricate the wing cuffs. Tim's experience with composites and glass-fibre enabled him to transform Afandi's CAD designs into his 'Timlets'. The last element of the hardware was a pyro sequencer, as to produce a seemingly continuous trail of sparks would actually require a number of the clusters to fire one after the other. Chris Cain of Think Tank Electronic designed and built a tiny control box to fit to each wing tip. The initial thought was to use a secure radio link to start the pyro sequence, but this was changed to a hardwire system due to possible interference over the Stadium. Mike wanted to have one of the charity's successes at the controls during the flight, so invited the Aerobility membership to a simulator challenge. The minimum requirements were a PPL and lots of free time. One candidate stood out, the aforementioned young Lance Corporal, Dave Rawlins. Dave was very keen to be an ambassador for Aerobility but needed to fly more hours before starting his twin rating to fly the Tecnam, so the race was on against the wettest British summer on record. Once Mike had established the mechanics of the display flight, the biggest remaining challenge was the certification process. 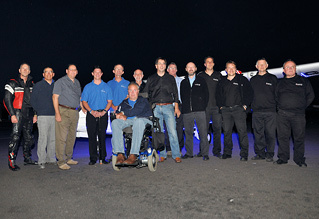 Despite many of the team having deep reservations, Mike's charisma and passion to achieve the impossible won through. The UK CAA were keen to see the project succeed and suggested the best way forwards was to obtain a 'permit to fly' from EASA to allow the modifications to the Tecnam. The cost and time implication was enormous, but with no choice other than to 'follow the rules', Gama Engineering at Fairoaks were tasked as a Part 21J Design Authority to start the certification process. Just as the critical point was reached with EASA in Brussels, EASA pulled the plug and declared that their office would not have the resources to process the Permit to Fly application in time for the ceremony and they would hand the project back to the UK CAA to process on their behalf. The project was in danger of being killed by bureaucracy. 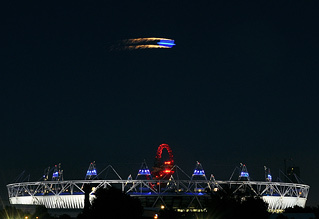 Meanwhile, The POC Creative team were focusing their attention to the flight profile over the Olympic Stadium. The viewing angles from beneath the Stadium roof were calculated and a scheme devised to put the Tecnam in view of the most number of seats with a series of orbits, flown at minimum turn radius. Dave Rawlins started training with Guy in Aerobility's PA-28 Warrior, concentrating on flying accurate tight turns with high angles of bank at low speeds, the target to fly four complete orbits, fully adjusted for wind in 150 seconds. 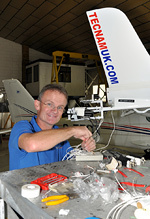 Dave moved on to the Tecnam and completed a multi-engine course. Time was getting tight. The CAA regained control of the certification process with only 2 weeks to go. They could not agree to a UK issued Permit and insisted on a full Supplemental Type Certificate (STC). This is normally months of work, but the clock was ticking with just 7 days to the first dress rehearsal over the stadium. After a frantic week, heated emails and telephone calls and sleepless nights about flutter calculations and a million other things, the paperwork was filed, boxes ticked, LEDs stuck on and wingtips mounted, the whole team was ready. With the CAA airworthiness department and Gama engineers all satisfied, test pilot Dan Griffith developed a test schedule and the Tecnam was put through its paces with Dan and CAA Chief Test Pilot Paul Mulcahay each flying the aircraft. With the flight tests complete, the STC arrived in the nick of time for the first rehearsal flight with two hours to spare! The spotlight now focused on pilots Tim Orchard and Dave Rawlins who would manage the flights together. 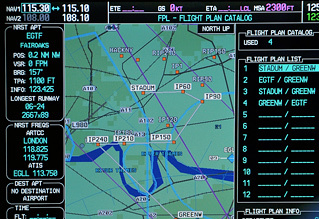 The restricted airspace over London would need a number of permissions for the flight to take place, including display permissions, exemptions to fly below 1000ft, exemptions to enter the Olympic restricted airspace and requests to suspend operations from London City airport for the duration of the practice flights and displays. Once in the aircraft, their challenge was not only to fly accurately over the Opening Ceremony, but also to negotiate their time critical approach profile through the busy airspace around Heathrow and London City to arrive exactly on-time. An 'Olympic box' of protected airspace had been setup over the Olympic Park area for the Games to enable broadcast helicopters to self separate and deconflict, and although this would mean the orbits would be inside the box and free of interference from ATC, regrettably the cube of protected airspace was not designed for the time critical extended approach profile of the Tecnam, and while the controllers and airspace managers argued about the legality of helicopter camera ships formating in controlled airspace, and the minimum separation standards for Special VFR, the team focused on how to get over the Stadium on time. The plan was to fire the wingtip pyros at the exact time Dave asked the crowds to look-up, with the aircraft calculated to be over the downwind edge of the stadium. The Tecnam is fitted with a state of the art GPS that plots waypoints onto a colour map. The team also equipped the Tecnam with a radio-controlled clock - accurate to a fraction of a second - but this wouldn't allow any leeway for delays in the action in the stadium if a fixed target time was set. The solution was to start the aircraft's countdown clocks with a radio call at the start of the video tape (VT start) as Dave's 'look-up' cue was exactly 8 minutes 37 seconds into the video and construct a series of checkpoints on the approach path to monitor the aircraft's progress. The day of the ceremony was tense. Winds checked and the approach waypoints calculated, batteries charged, pyros prepared, mounted and wired up and checked and checked again. The weather wasn't great with strong winds and rain battering London all morning, but a clearance was forecast for late afternoon, albeit leaving a strong south-westerly wind. Many of the team were in the stadium, but Guy Westgate had the best vantage point of all, up on the stadium roof as Flight Safety Director, and monitoring the progress of the “Blue Whale” - as Mike had nicknamed the Tecnam - as it held south of the Thames. Dave and Tim then started their approach pattern, shadowed by a TV helicopter streaming video to the stadium. Guy states that the sound system in the stadium was incredible, with speakers suspended around the roofline, directing the video's soundtrack downwards towards the spectators, but hardly audible from the roof itself. The video's soundtrack included Dave's 'look-up' reveal cue, and as the Tecnam first appeared the pyros fired and a wall of noise filled the Olympic Stadium, not from the speakers this time, but from 80,000 screams and shouts below, which was a very emotional experience for Guy and the team. The small Aerobility team had excelled. There can be very few volunteer projects which have brought together so many specialists - many of them quite unique in their field - all indispensible to the success of the project and wholly focused on a single goal. Recognition must also go to the professional contributions from Gama Engineering and Tecnam UK together with partner AEROS Ltd. A week after the opening ceremony a re-run of the display was held at Aerobility's Blackbushe base in front of an invited audience of all those involved with the project as a token of gratitude for their unstinting efforts in bringing the venture to fruition, and it is from this event that most of the illustrating images were taken.